The most popular resort of Bali — Kuta. Here marvelous beaches with golden sand, the mass entertainment, sunsets in the evenings if descended from the world's best paintings painting geniuses. Kuta is located near the capital of Bali, Denpasar. To get here from the airport in Denpasar, have to pass through the noisy and confusing capital. If you do not want to stray and pay through the nose taxi drivers on duty at the airport, it is worth in advance take care of booking Transfer to Kuta. Pick up a car based on the needs of your companies can group and individual Transfer cars, jeeps, mini venah and buses. Transfer company pick you up upon arrival at the exit from the airport, and a maximum of half an hour you will bask in the sun in the gentle Balinese Kuta. On the day of departure at the hotel you will have to wait for a car which is the beginning of registration for your flight will take you to the airport in comfort. Transfer booking is a very demanded and necessary service, which is not always provided by tour operators and hotels. If you are looking for how to get from Denpasar Bali Airport to Kuta, which is located in the country Bali / Indonesia. We can offer you various transfer options for booking. It can be comfortable buses or minibuses for group transfer, as well as business and economy class cars that take you from the airport or railway station to the hotel and back. Transfer fee. In order for the site to calculate the price of transfer from Denpasar Bali Airport to the hotel to Kuta and back, you need to select the arrival date, number of adults and children, as well as vehicle options. Payment is carried out using a bank card. The cost of an individual taxi Denpasar Bali Airport - Kuta to the hotel includes: transport operation, fuel, driver, local taxes, delivery to the destination, 1 luggage space per 1 passenger. 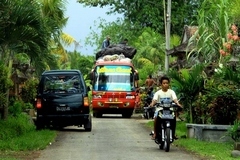 Kuta situated at a distance of 3.4 kilometers from Denpasar Bali Airport.